Gentlemen, start your engines! We’re headed to Motor City. Detroit, home of Henry Ford and the 20th century’s automotive epicenter, is known as the king of all things “road” – but their airport also makes them a top dog in sky travel. 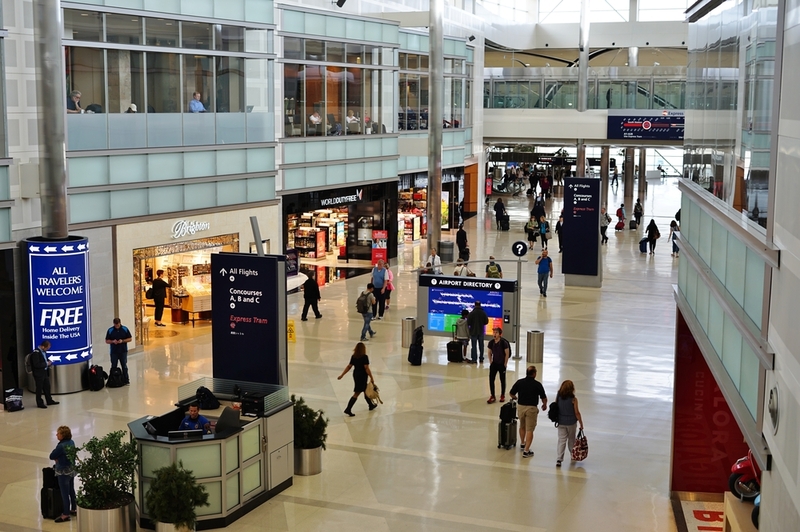 Detroit Metro Airport boasts some pretty significant stats: it serves approximately 34.4 million travellers every year, coming and going from over 140 destinations across the globe. In the last few years, Detroit has slowly been re-establishing itself as a happening tourist destination. Foodies, auto aficionados, and music enthusiasts are well-served by its vibrant restaurant and music scene (it’s the birthplace of Motown, after all!) as well as the largest car show in the country. Before you go, here are the ins and outs of the DTW airport. DTW is served by four garages and lots, offering two short-term parking options and four long-term options, as well as valet service. Each of these parking areas is connected to the free shuttle network, which runs between the airport lots and both terminals’ Ground Transportation Centers. The McNamara lot serves its namesake McNamara terminal, and the Big Blue Deck lot serves the North terminal. Both parking areas charge the same rates for short-term stays: $4 for 30 minutes or less, $8 for 2 hours, $20 for 5 hours, and a maximum daily charge of $33. Those same two parking areas can accommodate long-term stays. While the rates at both sites remain identical for up to 3 hours of parking, the McNamara lot continues charging incrementally up to $23, whereas Big Blue Deck caps off at $13. So, once you hit the 3-hour mark at both lots, McNamara will begin charging $16 for the fourth hour, then $20 for the fifth, and finally, $23 for anywhere between 5 and 24 hours. At Big Blue, you’ll be paying a $13 flat fee for the whole day as soon as you exceed 3 hours. Finally, Green Lot 1 is attached to the North terminal, whereas the seasonal Green Lot 2 is a little further out. Both charge a flat $11 daily rate. DTW’s hotel hotspot is located just north of the airport, on the other side of Rte. 94. Free breakfast coupled with free WiFi is not hard to find around these parts: these perks are offered by the Wyndham Garden, Comfort Inn, Sheraton Detroit Metro, Baymont by Wyndham, SpringHill Suites, and La Quinta Inn. Looking for free airport shuttle service? Try the Four Points by Sheraton, Sheraton Detroit Metro, Courtyard by Marriott, or Hilton Garden Inn. Enjoy your stay! If you’re not looking to shell out for a taxi or rental car, DTW is served by the SMART bus system. Full fare is just $2.00. The city recently rolled out an airport-specific service called FAST, which limits the number of stops between DTW and downtown for a quick and painless ride into the city center. Now that you’re an expert on the inner workings of Detroit Metro Airport, here’s your key to navigating the world of airport parking: OneStopParking.com is your ticket to super-low parking rates and an online booking service for tons of airports in the U.S. and Canada, so give us a visit today to save big on your next stay.